The 37.5 metre sailing yacht Ludynosa G, jointly listed for sale by Burgess and McMaster Yachts, has been sold with Chris Daves at Denison Yacht Sales introducing the buyer. Ludynosa G was built in aluminium by New Zealand yard Fitzroy Yachts to a design by Dubois Naval Architects and was launched in 2005 as a fast cruising sloop. Lloyd's classed and MCA compliant, she has a comfortable four-cabin interior by RWD and room for a crew of up to five people. Sun worshippers are well catered for by a tender well that converts to a sunbathing area when she is in port. Furthermore, a sunpad is accessible above the pilothouse and the cockpit provides a convivial al fresco dining area with its composite Bimini top. There is room for eight guests in the aft cockpit and, come nightfall, this area can be transformed into a marvellous outdoor theatre with a 50-inch screen and a drop-down film projector. Guest accommodation aft includes a twin cabin that converts to a double with an additional Pullman berth, a VIP queen cabin, a second twin cabin with Pullman and the owner’s cabin, complete with seating area and desk. All cabins have full en-suite shower facilities and a light atmosphere is created with large hull-mounted windows throughout. All en-suite bathrooms are finished with one piece Carrara marble floors. 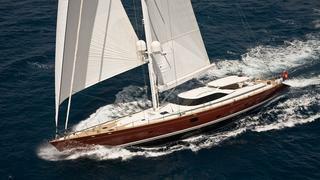 Upgrades include a full set of Doyle Stratis sails in 2012. With a strong charter history, she has a cruising range of 4,000 nautical miles under power courtesy of her 700hp Caterpillar engine.